Yes, I know, I should not say "low season" anymore! But May is not exactly the summer either... May is normally just about the quietest month for tourism in Phuket, coming after the end of the high season, after Easter and before the European summer holidays. In terms of weather, this is the month of change, but even now on the 20th we have not seen the real southwest winds blowing. Still calm and hot with some heavy showers, very humid. The last few days have seen plenty of sun, mixed with light rain and occasional heavier downpours - yes, not great weather but on the other hand it's not stopped us from doing what we want. You have to be a little flexible and bend with the weather at this time of year. 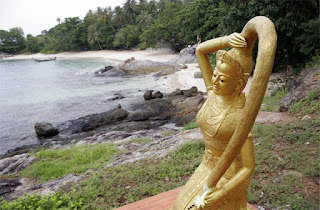 On Sunday we planned to head to Rawai Beach and hire a longtail for a bit of island hopping - there are a number of small islands within easy reach such as Koh He, Koh Bon and Koh Kaew. 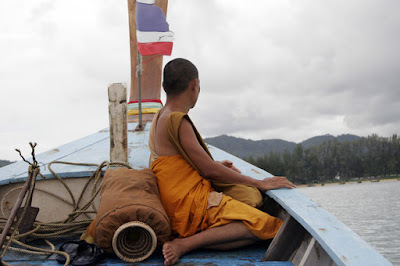 The weather was certainly rather grey, looked like rain, but once we reached Rawai we thought "Let's Do It!" - we hired a boat from Mr Chin and I can recommend his service - his mobile is 081 6072427. The price was to be 1300 Baht to go to Koh Kaew and then back via Koh Bon. The trip will be blogged soon on Jamie's Phuket! Weather certainly was grey - a light drizzle fell most of the morning, but the sea was pretty calm and a bit of drizzle did not spoil a nice little trip. A couple of lazy days followed - Monday was a bit rainy - we had some jobs to do around town such as sorting our car insurance and buying some new glasses. We lunched at Kaewjai and shopped at the "Expo" indoor market in Phuket Town - lots of clothes. We drove around Sapan Hin and sat in the car staring at the sea as some heavier rain fell - hey this is like a day at the seaside in England! Tuesday was equally lazy. The morning sun made we want to just sit and relax all day... my adventurous parents headed to Mai Khao Beach right in the north of Phuket. We bummed around at home and bought some new garden furniture. Today has seen a lot more sunshine. We did a little temple tour - I am a big fan of temples! 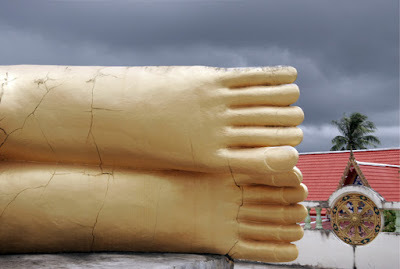 I took the folks to Wat Sri Sunthon just south of Thalang in the center of Phuket island - there is a huge reclining Buddha there on the roof of one of the temple buildings. Dark skies threatened and it rained a bit as we drove 15 minutes to Wat Phra Tong. 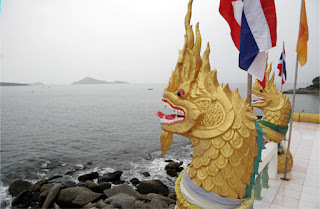 The evening is the same - I can see blue sky and dark clouds from my window right now... we don't care it it rains - we're all heading out to the Phuket Brewery for dinner to celebrate dad's 69th birthday! Happy Birthday!